Warner Bros. and DC have reportedly set an official release date of April 5th, 2019 for Shazam! The DCEU has gone through numerous scheduling changes recently, and it was unclear whether the movie would keep that original spot or be moved down. April is kind of an unusual time for big blockbuster movies to come out, but as Captain America: The Winter Soldier proved in 2014, that doesn't mean they can't gain success in that release slot. However, Shazam! is a lesser-known property and an April release date may be perfect since it won't have as much competition, getting in right before the MCU's Avengers 4. Zachary Levi recently revealed that he has prepared to start training for the role and also talked about when he first realized that he would have to get in superhero shape. He says it will take him as long as necessary to get there for the role, and also that he plans to stay in shape after production has wrapped, which may mean that there have been talks of a sequel or possibly meeting up with Black Adam. Levi was recently cast as Shazam, while Disney Channel star Asher Angel stars as Billy Batson, the boy who turns into the superhero. Mark Strong is also rumored to portray the movie's antagonist Dr. Sivana. Dwayne "The Rock" Johnson was originally attached to the movie as Black Adam, but will reportedly star in a solo spin-off instead. 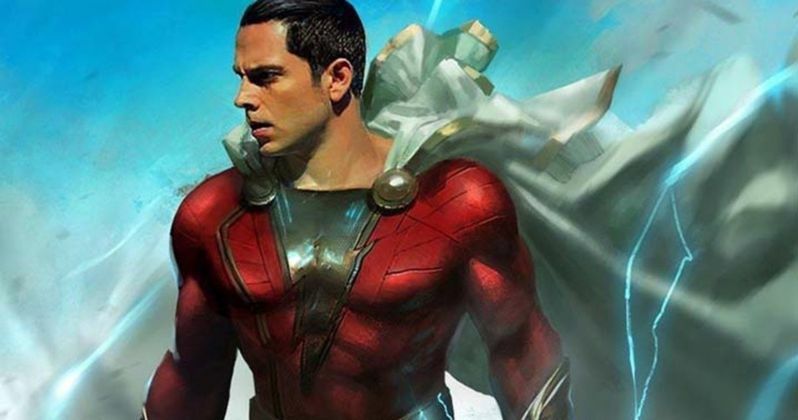 Zachary Levi also revealed that Shazam! will be similar to Tom Hanks' 80s classic Big, in that we will see a kid grow up and learn to utilize superpowers while tugging at the heartstrings. The movie will see a young boy use magic words to turn into the adult superhero Shazam, so the Big comparison works out pretty well if one thinks about it. The added superpowers will add an interesting spin on the theme of the 80s classic and Levi remains confident that they'll be able to pull it off. Each letter in Shazam corresponds with one of the magical abilities Billy Batson inherited from various Greek and Roman characters: S for the Wisdom of Solomon; H for the Strength of Hercules; A for the Stamina of Atlas; Z for the Power of Zeus; A for the Courage of Achilles, and M for the Speed of Mercury. Whenever Billy Baston says the word "Shazam!," a magical lightning bolt strikes him, and he becomes the adult Shazam!, though he still has a child's intellect and personality. Shazam! is officially all set to hit theaters on April 5th, 2019 after months of speculation. The movie will be will be the first movie released from Warner Bros. and DC Films following December of 2018's Aquaman. Shazam! is directed by David F. Sandberg (Lights Out, Annabelle: Creation). This is exciting news for DC and Shazam! fans, and more news is expected to drop in the next few weeks. Until then, you can check out the release date courtesy of The Hollywood Reporter.